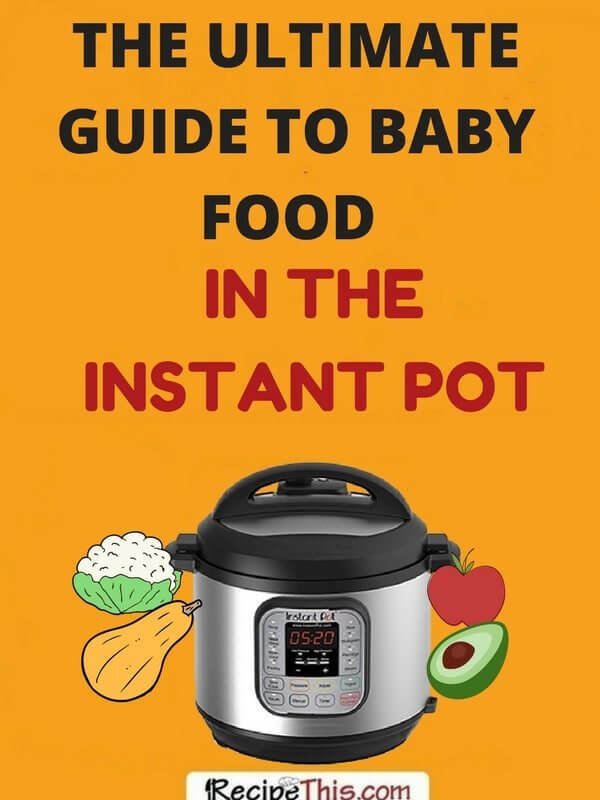 Instant Pot Baby Food Recipes For Beginners is a collection of what I personally fed my two youngest children during the weaning process. These Instant Pot baby food recipes are perfect for beginners that don’t know where to start. As you read up on Instant Pot Baby Food recipes, you will find a lot of information that is missing. That is because I have seen a lot of what is written is NOT written by parents of babies. That is why you will love what I have put together here on RecipeThis.com because I am a mum of 3 and understand how time consuming it can be to make baby food. I have 3 children. Kyle my eldest is 17 years old, Sofia who is nearly 4 and Jorge who was 2 this month. With each of them I can remember the stresses and strains on family life when you are trying to introduce them to new food. When Kyle was a baby I remember that he refused to chew any food in the later months of weaning and I thought I would never get him eating. Now you can’t stop him, and he loves his food. When Sofia was a baby she used to look at me in disgust at the thought of pureed food and when I tried to introduce older toddler food to her, she was even worse. I put it down to her being a fussy girl which she still is now. When Jorge was born I thought we would have easy street. We had experience of 2 kids behind us and knew what we were doing and was excited to finally be a family of 5. Instead we had a baby with a LOT of colic. I had never come across a colicky baby before and it really was hard work. He didn’t sleep through until he was more than a year old. But what he did love was his baby food, well as long as you didn’t give him anything that set off his colic. But Jorge is the only one of our 3 kids to have his baby food made exclusively with the Instant Pot. It wasn’t around when Kyle was born and like badly educated parents at the start of the 00’s we knew no better, then to buy baby food from the shop in the jars. With Sofia we didn’t get an Instant Pot until her 1st birthday so she had a lot of baby food made in our soup maker instead. The conversation on the Instant Pot community is often why you need an Instant Pot if you love cooking. I always explain to them, that I love to cook but the Instant Pot can make some tasks exceptionally easier. You can make condensed milk to caramel in 40 minutes, you can steam vegetables in 2 minutes, you can make an egg loaf in just 7 minutes and then don’t get me started about how amazing steamed desserts are. You can click here to view the one we have. With Sofia I remember the first time we pureed some apples for her. It took us all day. That’s because we did it in the soup maker and the cooking area was so small. I just wish I had an Instant Pot at that time. Once you start making Instant Pot baby food you will realise just how easy preparing food for your babies can be. Especially, when you consider the size of the Instant Pot and how many months of baby food you can prepare in one go. Before I introduced Jorge to eating vegetables at six months I started him off at 4 months with what we call baby cereal. This is porridge for babies and there are a lot of brands out there that do this kind of food. This is the brand we recommend if you haven’t chosen one yet. You start off with a teaspoon of the baby cereal mixed with either their breast milk or formula milk. Then it gets them used to your spoon and starts the weaning process. Plus, at four months they are often getting hungrier as breast milk on its own is no longer enough to satisfy their appetite. Then once you have done the baby cereal process you’re ready to move onto vegetables and making vegetables using the Instant Pot. Then if the puree is too thin you can use the baby cereal to thicken it up and it can work like a corn flour on their food. Or if they are on formula milk, you can use that powder instead. That truly is the way to start and to get them used to eating vegetables. I started weaning Jorge onto his vegetables at 6 months old. To begin with they only want very small portion sizes as they adjust to their new food. Think 3 heaped tablespoons each time you feed them and try them on it twice a day. Once for lunch and once for dinner. Start them first with broccoli, cauliflower, carrots, sweet potatoes, swede and butternut squash. These are the easiest for you to prep and are good quality foods that will get their stomachs ready for real food. Avoid white potatoes, cabbage and peas because it can give them excessive wind. White potatoes can also be too starchy for them and give them an upset stomach. I also avoid courgettes and pumpkin. This is because they are so watery you will need a lot of thickener to get the puree right. Avocados and bananas have a lot of nutritional benefits and if you are a tired mum, it’s a quick and easy food for them. With bananas and avocados, I tend to keep it for them as a snack, rather than as a meal option. I also use half the portion size as I do with the vegetables. Start by introducing just one food. Stick to that one food for 5 days. It could be carrots as that is my favourite starting food as its so easy to digest and high in carbs. Then give them that food at mealtimes for 5 days. Followed by what you normally feed them. This might be some carrot followed by breast milk or a formula bottle. Then keep doing this until 5 days have passed. Then on the 6th day introduce a second food. Your baby then has one food type for lunch and one for dinner. Then after 10 days follow this up with a third food and then carry on this cycle until you have introduced him or her to the 8 foods above. Then as they fall in love with the different foods you can give them a mixture of those foods at mealtimes. Once a month has passed slightly increase the portion size. Until they are 9 months and you can be looking at new foods to get them interested in. Though we kept Jorge vegan until he was a year old. That way we could focus on him getting lots of great vegetables and some fruit in his diet. Babies and toddlers always view new food with suspicion and you need to keep going at it until they get used to all the different foods and are settled in their new eating habits. For quick vegetable recipes these below are my all time Instant Pot favourites. You can also bulk them up for the freezer. Cook the vegetables in bulk and then save them into little ice cube trays or into small storage containers. Then it saves you constantly pureeing food for your babies. Swede (also known as rutabaga) is a delicious vegetable from the turnip family, but not as bland. Because it is full of flavour it is perfect for babies. When your baby gets older add some carrots to it for carrot and swede mash. 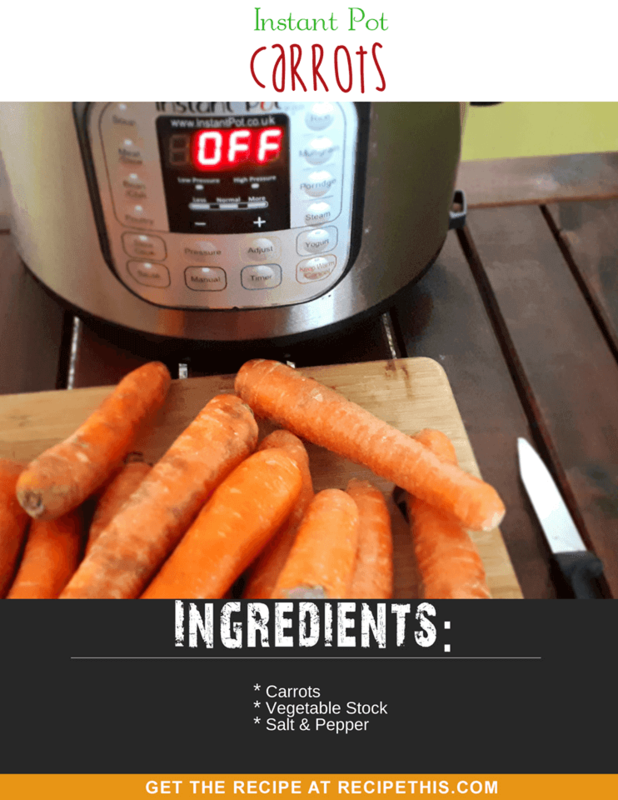 I love carrots in the Instant Pot as they go from hard to soft so quickly. They are also a perfect flavour and texture for small children that need something with carbs that will fill them up, but without them feeling unwell. Cauliflower is good for them as its full of nutrients and fills them up. You also don’t need much of it as it purees well. Plus, just like adults on Paleo, you can use cauliflower as a base for other food as they grow and start to like textures. 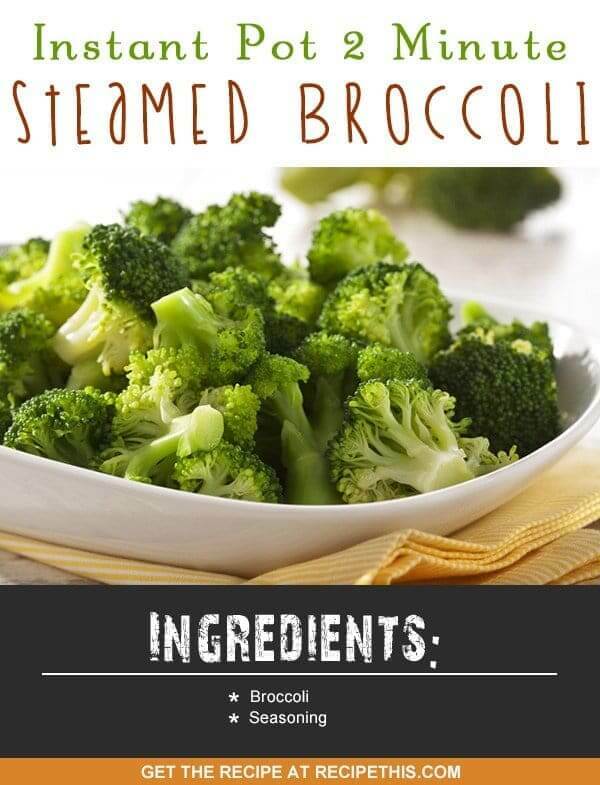 Broccoli is a very cheap vegetable if you are feeding your baby on a budget. Plus, it is easy to puree and as an alternative you can feed them broccoli soup instead. Sofia used to love it when I made her some broccoli soup for her dinner. Butternut squash is one of those carb-based vegetables that is perfect for if you want something filling. Give it to your babies too when you make some for yourself. Then puree yours and they can see you eating the same as them and they will respond to this. Mash is one of those comfort foods that kids just love. Get them introduced to it with some sweet potato mash. Instead of adding loads of butter add a little breast milk instead and they will love it. Once you get into it you will see just how easy it is and how the Instant Pot makes it so much easier and healthier. But don’t blame yourself if they genuinely hate a new food that you introduce. Sofia hated avocados as a baby but loves them now. Kyle hated eggs and still does. Jorge will just eat everything but as he always gets upset with wind we still avoid cabbage from his diet.